We believe all Veterans in Business can succeed together. The Veterans In Business (VIB) Network is a nonprofit 501(c)3 organization that advocates for all Veteran Businesses including SDVOSBs and DVBEs. We help build connections between Veteran Businesses, Corporations, Government Agencies and Prime Contractors looking to create business opportunities together. We provide FREE business resources, educational seminars, outreach opportunities, and a Veteran 2 Veteran Mentor/Protege Program. Our National Conference is widely considered one of the best Veteran business networking events in the country. 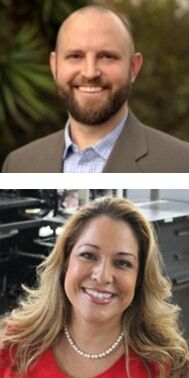 VIB Network co-founders, Cole Woodman and Rebecca Aguilera-Gardiner, are both owners of successful SDVOSB/DVBE companies and are passionate about changing the narrative about Veteran businesses. Chairman Cole Woodman is a US Naval Academy graduate who received his B.S. in Quantitative Economics in 2005. He is the owner of a successful SDVOSB/DVBE general engineering and construction company. As a Disabled Veteran, he believes in giving back to the veteran community and sharing his entrepreneurship and business skills with other Vets is the best way to achieve this. He also feels that the SDVOSB and DVBE programs offer excellent opportunities for all veterans in business to succeed. Cole currently serves on the California Veterans Affairs (CalVet) DVBE Advisory Council and is Chairman of the DVBE Procurement Committee. In January 2017 Cole won the California Department of Veterans Affairs, John K. Lopez Award for Individual Excellence. Cole’s leadership and foresight with his expertise and experience will help the VIB Network grow. Executive Director Rebecca Aguilera-Gardiner is the co-owner of a successful SDVOSB/DVBE second generation printing business. She has over twenty-five years of experience in sales and marketing and has been essential in the continued growth of the 45-year-old company. Rebecca has over thirteen years of experience in organizing and successfully executing national Veteran conferences. She is also former Chair of the San Diego Workforce Investment Board. Currently, Rebecca is active in Business Leaders United and was invited to the White House for a bill-signing by President Obama. Rebecca is also a member of Business Forward and has advised on the TPP and environmental issues. She was instrumental in getting California Governor Jerry Brown onsite to her business for a bipartisan bill-signing concerning workers comp. Her business has won several awards including MBE Supplier of the year and Family-Owned business of the year. In 2016, Rebecca won the John Rak Award for her dedication in helping SDVOSBs. Rebecca was honored at the MCCSN “Women Leading the Way” luncheon in March 2017. Her enthusiasm to truly help veteran businesses grow is infectious and she believes collaboration is key to the success of the VIB Network. The VIB Network Inaugural National Conference in Palm Springs California was a huge success! Check out the recap and mark your calendar for the 2nd Annual Conference in Los Angeles, California, November 5 & 6, 2018. Enter password “vib” to watch the video! Thank you to our Charter Sponsors – those who believe in supporting Veteran businesses. Charter Sponsorship is a lifetime VIB Network recognition and is only available until March 31, 2017. If you are interested in becoming a VIB Network Charter Sponsor please Contact Us or call toll-free 877-270-8426. We’ve long been committed to working with women; minorities; service disabled veterans; and lesbian, gay, bisexual and transgender enterprises. Today we spend $1 billion+ with these firms, representing more than 40% of our total procurement dollars. Quite simply, Supplier Diversity is a core business strategy for us. Our Supplier Diversity and Development team of professionals delivers sustainable solutions. The team strives to drive economic value for customers, suppliers, communities and shareholders by developing and integrating diverse businesses into the procurement process. At San Diego Gas & Electric® and SoCalGas (Sempra Energy’s California utilities), we are committed to working with a wide variety of diverse suppliers. Our commitment to supplier diversity helps provide our customers with the best possible energy services at the most competitive prices. We always seek qualified new suppliers who can help strengthen our supplier base and resources and share in our success. On our website, we provide information on how qualified businesses owned by minorities, women, and service-disabled veterans can participate in our procurement process. In addition to working with DBEs, we also support non-DBE businesses that participate by subcontracting work to participating DBEs. To encourage diversity among our prime contractors, each year we ask them to support our goal of subcontracting 30% of their services to such businesses. Sign Up for Updates – or if you have questions or suggestions, please Contact Us! Veterans: Join today! | Buyers: Looking for a VIB? | Already Registered? Search the Directory or change your Profile.